Place chicken breasts into a pot that can fit both breasts in a single layer. Cover with water, then add peppercorns and a couple sprigs of parsley. Bring to a gentle boil and simmer until cooked, about 10 minutes. Check by removing, and slicing through the middle; look to see that it is no longer pink. Refrigerate or freeze the stock for use in future recipes. Mix together the carrot, cabbage, shallots, parsley and celery to make a spring salad. Add apple cider vinegar to taste. Place on two dishes. 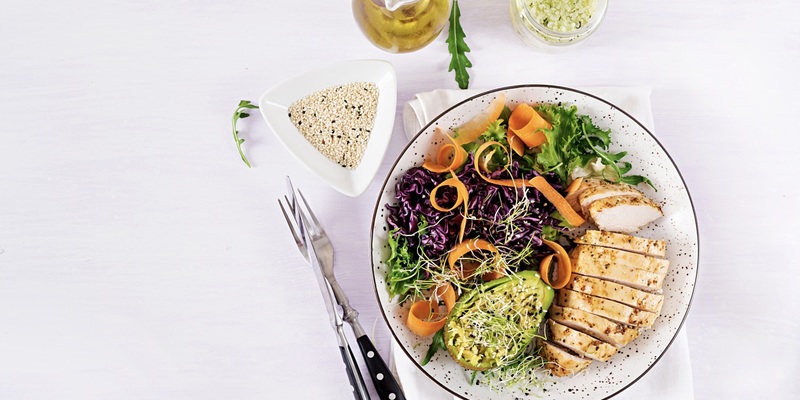 Slice chicken thinly and arrange on top of the spring salad. Place avocado on side and sprinkle with pepitas to serve.